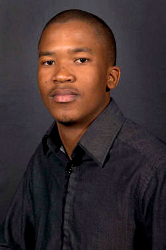 Unitas mens’ residence primaria of 2012 and current SRC Arts and Culture officer, Sanda Ncama, is one of the top six candidates in One Day Leader season two on SABC 1. The series started on Sunday, 17 February 2013 and over the next 12 weeks, SABC1 viewers will see these young people executing challenges and debating leadership skills. They will tackle modern day social, economic and political issues to compete for the title of One Day Leader. Each candidate is fighting for the favour of viewers who vote via SMS during each episode for the leader whose vision they support. In studio, during debates the candidates interrogate each other and are interrogated by judges Phuti Mahanyele and Shaka Sisulu. At all times candidates are judged and evaluated on One Day Leader’s six pillars of leadership; willingness, vision, attitude, influence, action and accountability. Talking about the leader he admires, Sanda says, “Ngu Zizi, Jamaka Sjaduu Dlamini the son of Govan, the former President Thabo Mbeki. He is articulate, intelligent, a world-renowned economist and politician. NMMU has made me and molded me as a person, and as the leader that South Africa will be seeing every Sunday. Indeed, I hope I’ve made the institution proud,’’ he adds. One Day Leader airs every Sunday at 18:30 on SABC1.